Please contact your PSO for information on upcoming Community and Competition-Introduction workshops. Please contact TTCAN (mario.potvin@ttcanada.ca) for information on upcoming Competition-Development workshops. With the completion of our NCCP transition (levels to contexts), the Coaching Association of Canada has now completed the transfer of qualifications in the Locker (online database). 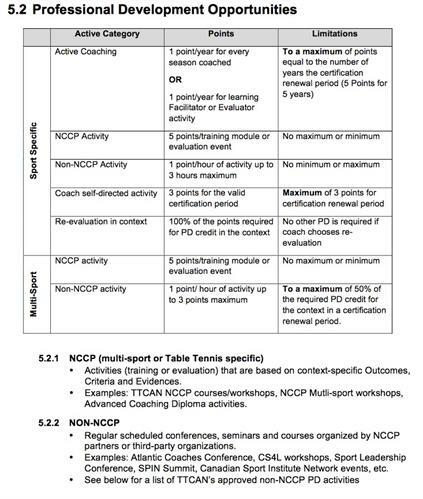 Every coach with a Levels Certification now has an equivalent certification in the new NCCP (ex. Level 3 Certified Coach is now a Certified Competition-Development Coach). Depending on the credentials that a coach earned under the old program (levels), he/she received credentials in the new NCCP based on a transfer plan that was developed and approved by TTCAN and the CAC. Many different combinations of training and certification were found and therefore the transfer plan was developed to promote the coach’s credentials. For example, a coach who was Certified Level 1 + Technical 2 + Theory 2 (Certified Level 2 not completed) was promoted to Competition-Introduction Certified Base Coach and Competition-Introduction Trained Advanced Coach. *This is just one example of the numerous combinations of training and certification found in the Locker. The Locker generated a personal email to every coach in the database when the transition took place in early 2017. If you are unsure of your new credentials, please login to The Locker using your NCCP number and password to access your transcript. 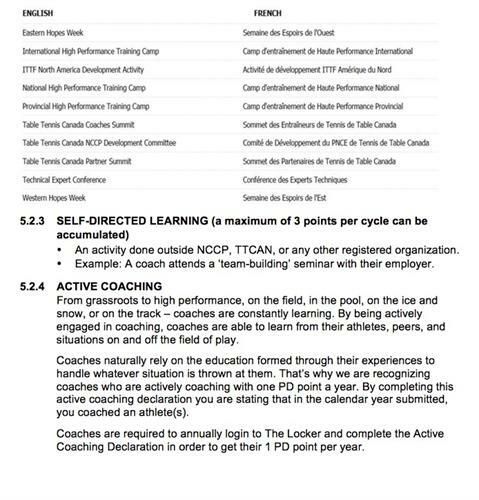 In order for NCCP coaches to maintain their certified status, they will be required to obtain Professional Development (PD) points. PD points can be earned through a multitude of activities that coaches already participate in, including: national and provincial sport organization conference and workshops, eLearning modules, NCCP workshops, coach mentorship programs, and active coaching. In most cases, coaches are already earning their required PD points –Maintenance of Certification Status is simply the introduction of tracking these points and recognizing the coaches for their efforts. How to submit my PD activities to accumulate my points? When attending an event/activity/other, simply indicate to the organizer that you would like to receive PD points for this activity. The organizer of the event is responsible of informing the sport organization (in our case, TTCAN) of the names of who attended the event and the sport organization will submit the information to the CAC to be inputted in the Locker. What if I am certified in two (or more) contexts or sports? If you are certified in two different contexts in one sport or in two sports, your PD points will be applied to both contexts and/or sport. The number of points required to maintain certification will be determined by whichever sport or context requires the highest number of PD points. If you have any other questions, please visit the FAQ’s page on the CAC website! 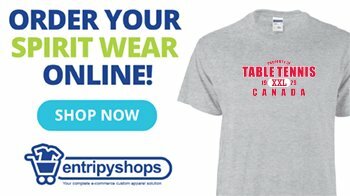 Or send an email to Table Tennis Canada!